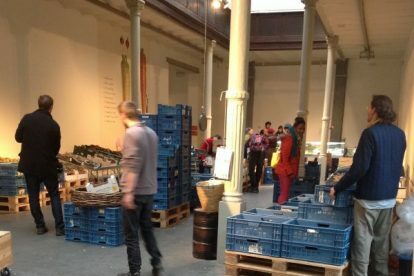 Housed in an old wine warehouse – the fin-de-siècle ‘Palais du Vin’, Marché des Tanneurs is one of the best places to buy fresh food in Brussels. The market is entirely organic and offers an incredible array of seasonal vegetables and fruits directly from producers. What’s more, there is also a good selection of yoghurts and cheeses from Belgian farms, as well as a variety of dried products that are sold loose and priced by weight. You can dispense with wasteful and inefficient packaging and buy exactly the amount you need of rice, pasta, pulses, nuts etc. You can also buy quality olive oil and decent Sicilian wine by the litre from the large vats. If that’s not enough, they also sell freshly ground coffee, organic juices, biscuits, pastries and bread. The best thing about the market is the pleasant atmosphere that makes shopping there so much nicer than in the clinical environment of a supermarket chain. You just pick up an old box, fill it with what you want and then have it all weighed and totalled at the counters on the way out. It’s very efficient, good quality and surprisingly cheap.